Below is a map of the construction project starting this week on 14th street in front of our center that will make getting here a little more complicated than usual. Closed sections are in red and some ways to get here easily in green, avoiding the closed section of the road. 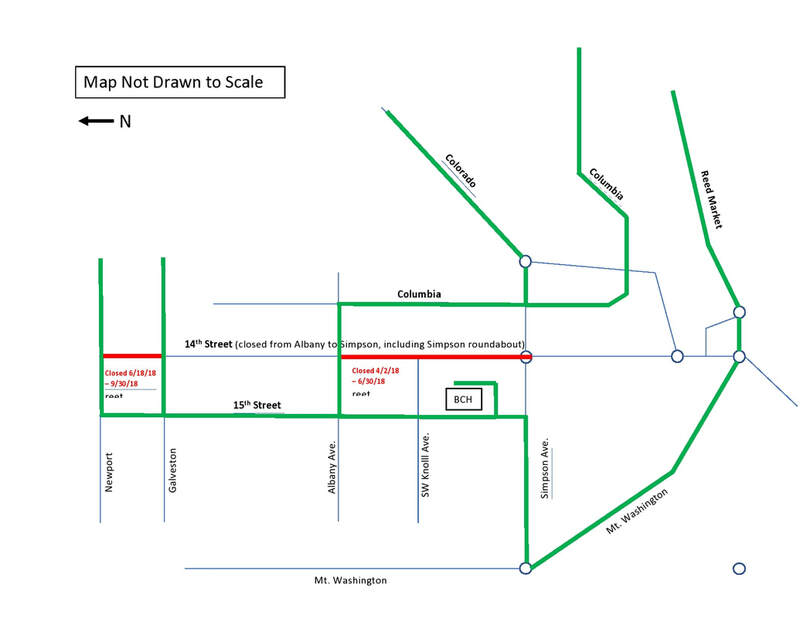 From the NORTH, 15th Street, which runs behind our office, will be the easiest way to access our parking lot. You can get onto 15th from the north using either Galveston/Skyliners or Newport/Shevlin Park Rd. to turn south onto 15th and turning left from 15th directly into the back of our parking lot. 1) You can cross the river on Columbia or Colorado, and go to the intersection of Colorado and Columbia. Either continue on Columbia or turn from Colorado Right onto Columbia and go past Commerce Ave. , then turn Left onto Albany Ave. Once on Albany, cross over 14th Street and turn Left onto to the 4th cross street (15th Street). Once you’ve crossed SW Knoll Ave you’ll turn L into the back of our parking lot. Two more quick Left turns and you’re at the office! 2) Or you can take Reed Market over the river to the 2nd traffic circle, turn onto Mt. Washington and, after almost a mile, at the first traffic circle, take the first exit onto Simpson Ave. You’ll follow Simpson down the hill almost to 14th, turn Left onto 15th, then an almost immediate Right into the back of our parking lot. Please feel free to talk with us (or call us at 541-322-9642) if you have any questions or concerns. We apologize for the inconvenience and look forward to seeing you soon.